Representatives of several U.S. Protestant denominations have published a letter comparing Israel to the Roman Empire and the Palestinians to Jesus. (Read it here: "O Come, O Come Emmanuel!") The letter, which takes the form of an Advent prayer quoting Isaiah's prayer for the coming of the messiah, was signed by missionaries representing, among other denominations, the Evangelical Lutheran Church in America, United Church of Christ, and the United Methodist Church. Their letter starts on a religious note (" 'O Come, O Come Emmanuel!' we will sing and pray as we make the advent journey to Christmas"), but it quickly shifts gears. The second paragraph provides a distorted, one-sided outline of Israeli actions in Gaza and the West Bank over the past year, using the typical tactics of describing the incursion into Gaza in isolation from its historical background, using casualty numbers which do not differentiate combatant casualties from civilian ones, and suppressing information about Hamas use of human shields. The letter also claims that Israel in 2009 evicted hundreds of Palestinian families in the West Bank and destroyed their homes in order to expand Israeli settlements. In support of this shocking claim, the letter cites a webpage at the Palestine Monitor website (read here) which in turn cites an unnamed study by the U.N. Rather than supporting the letter's claim that hundreds of West Bank homes were destroyed, the U.N. study figures quoted by Palestine Monitor claim only 43 homes were demolished (excluding those damaged in the Gaza war) and makes no mention whatsoever of settlement expansion. The Palestine Monitor article does go on to claim without citing a source that hundreds of Palestinian homes are "threatened by Israel’s policies", however, that article simply does not support the claim made in the missionaries' letter concerning hundreds of West Bank home destructions to expand settlements in 2009. Reflecting on the society into which Jesus was born, we see many similarities to life here today. The ancient Israelites were occupied and suffered at the hands of a foreign power. The Roman occupied lived freely, able to use and abuse the local population at will, while the subjugated peoples lived in constant uncertainty and anxiety, never sure how they would be treated or whether they would be singled out for random punishment. This is being repeated today for Palestinians living under the longest occupation in modern history, generally trying to live life and survive, but sometimes crossing the line into illegal and counterproductive violence, such as firing rockets from Gaza into Israel. O Come, O Come Emmanuel! To put this comparison in perspective, remember that the Roman forces in Judea are said to have massacred tens (if not hundreds) of thousands including woman and children, literally festooning roads with their crucified victims. The Roman war against the Jews included the Romans burning Jerusalem, including the temple, to the ground. What the Palestinian community faces, Jesus knew when he walked these stony hills. That ELCA webpage touts a fraudulent series of four maps purporting to show Palestinian losses and Israeli gains since 1946. In fact, it offers free of charge laminated cards bearing that series of maps to those who request them. 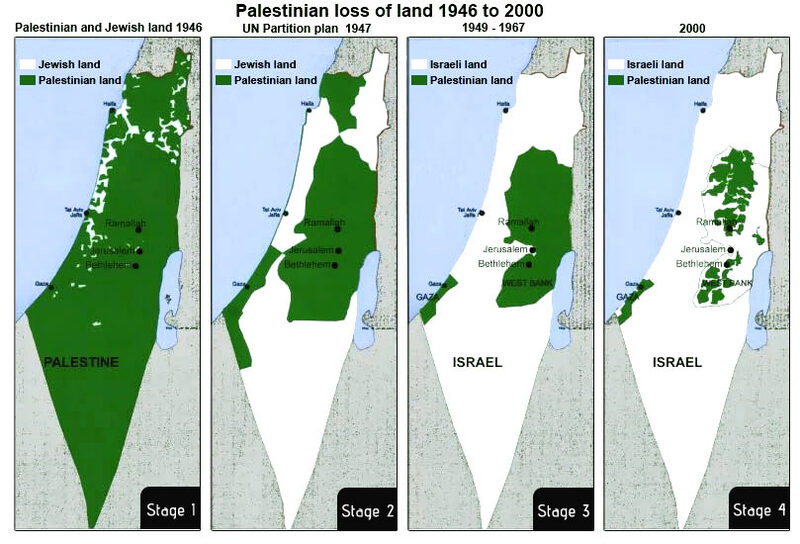 These maps (which are commonly promoted by anti-Israel activists) utterly distort the history of the region by conflating several categories of "having land" (individual ownership, various forms of political control, etc. ), by completely ignoring the historical context of Arab losses and by simply lying. The first map (labeled "Palestinian and Jewish land 1946", see below), shows land owned by Jews or Jewish agencies in white and all other land in the area, including the Negev and Judean wilderness, in green. It claims that the green was "Palestinian land", although, in fact, most of this land was not owned by either Jews or Arabs, was under the political control of the British Empire and was vacant. All prayers for peace and for the coming of the messiah aside, it doesn't take much to see this sort of thing for what it is: deliberately distorted anti-Israel propaganda dressed up in sheep's clothing. It would do every party to this conflict so much more good if those who purport to advocate peace would do so by promoting accurate, well-balanced views of the history of the conflict and by avoiding deliberately inflammatory invocations of Christ-killing imagery. At this or any other time of year, is that too much to ask? Its been hard to claim that the Palestinians are the indigeneous people, when anyone who remembers the Christmas story knows there were Jews and Roman, but no Arabs/Muslims/Palestinians. And yeah, that was 2000 years ago. I thought it might be helpful to recall that Yehoshu’a (Jesus) was a Palestinian. The district of western Asia long known as Palestine has a history which needs to be understood as we try to sort out the conflicting claims of Jews, Muslims, and Christians in the present day. Also, the 1946 map is straight-up lying about private Jewish land ownership (among other things); I don't see Kfar Darom (in Gaza), purchased in 1930 by Tuvia Miller and inhabited by Jews until they got expelled in 1948. Nor is there the land owned by Jews in Chevron, who'd been there well before anyone but a Jew was called "Palestinian"
But certainly, other than Bedouin (who primarily identify tribally, not as Palestinian) and the handful of Jews then in the Negev, it didn't belong to anyone except the British at the time, who'd conquered it from the Ottomans, who'd conquered it from the Mamluks who conquered it from the Crusaders who conquered it from the succession of Arab rulers who conquered it from the Byzantines who succeeded the Romans; before the Romans the very northern part of the Negev was part of the Hashmonean kingdom (native Jewish kingdom) while the rest was Nabatean and/or nomadic; before that the Greeks, Persians, Babylonians, the Kingdom of Judah and for a relatively brief period, the Kingdom of Israel. However, until recently (and even today to a large extent), it was damn near uninhabited, and those inhabitants were all nomadic. A study commissioned by the British Mandate authority in 1946 stated that Jews owned approximately 7% of the land, Arabs in the Mandate approximately 8%, absentee Arab landowners approximately 15%, and the British Mandate 70%. I do not have the exact source available, but a Google search would find it. The map is a complete lie. "'Palestinians drove Iraqi Jews to Israel"